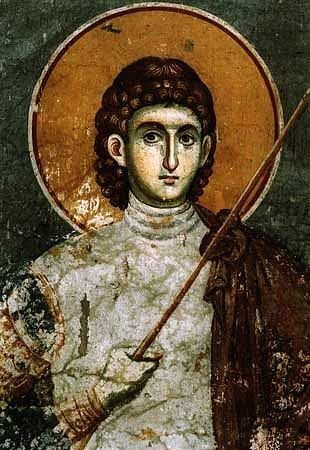 The Holy GreatMartyr Procopius, in the world Neanius, a native of Jerusalem, lived and suffered during the reign of the emperor Diocletian (284-305). His father, an eminent Roman by the name of Christopher, was a Christian, but the mother of the saint, Theodosia, remained a pagan. He was early deprived of his father, and the young lad was raised by his mother. Having received an excellent secular education, he was introduced to Diocletian in the very first year of the emperor's accession to the throne, and he quickly advanced in government service. Towards the year 303, when open persecution against Christians was enacted, Neanius was dispatched as a proconsul to Alexandria with orders to mercilessly persecute the Church of God. But on the way to Egypt, near the Syrian city of Apameia, Neanius had a vision of the Lord Jesus, just as once formerly had happened with Saul on the road to Damascus. A Divine voice exclaimed: "Neanius, why persecutest thou Me?" Neanius asked: "Who art Thou, Lord?" – "I am the crucified Jesus, the Son of God". And at this moment in the air appeared a radiant cross. Neanius sensed in his heart an inexpressible joy and spiritual happiness and he was transformed from being a persecutor into instead a zealous follower of Christ. From this point in time Neanius became fondly disposed towards Christians and struggled victoriously only against the barbarian pagans. But for the saint there transpired the words of the Saviour, that "the enemies for a man – are of his own household" (Mt. 10: 36). His mother, a pagan herself went to the emperor with a complaint against her son, of not reverencing the ancestral gods. Neanius was summoned to the procurator Judaeus Justus, where he was solemnly handed the missive of Diocletian. Having read through the missive filled with its blasphemies, Neanius quietly before the eyes of everyone tore it up. This itself was already a crime, which the Romans regarded as an "insult to authority". Neanius was held under guard and in chains sent off to Caesarea Palestine, where the Apostle Paul once languished. After terrible torments they threw the saint into a dank prison. By night in the prison room there shone a light, and the Lord Jesus Christ Himself, having come with luminous Angels, made Baptism for the suffering confessor, and gave him the name Procopius. Repeatedly they led Saint Procopius to the courtroom, demanding him to renounce Christ and anew they subjected him to tortures. The stolidity of the martyr and his fiery faith brought down God's abundant grace viewing the execution. Inspired by the deed of Procopius, beneathe the sword of the executioner went many of the holy prisoner's former guards and Roman soldiers together with their tribunes Nicostrates and Antiochus. And with martyr's crowns was sealed the faith of 12 Christian Women, having themselves come to the gates of the Caesarea Praetorium. Struck by the great faith of the Christians and their courage, and having seen the firmness of her son in bearing terrible sufferings, Theodosia became repentant and stood amidst the line of confessors and was executed. Finally the new procurator, Flavian, convinced of the uselessness of the tortures, sentenced the holy GreatMartyr Procopius to beheading by the sword. By night Christians took up the much-tortured body, and having wrapped it in grave-clothes, with tears and prayers they committed it to earth (+ 303).